Death Of The Black Model? We haven't purchased Ebony magazine in years. But we picked up the September issue, because, look! 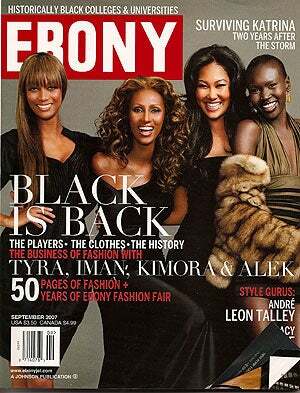 Tyra, Iman, Kimora Lee Simmons and Alek Wek! Also, the cover line: "Black Is Back." We were dying to find out where "black" went, and with whom! Unfortunately, the story inside is rather depressing. Tyra, Iman, Kimora and Alek are extremely successful. All have parlayed their name as models into other businesses: Tyra produces two TV shows; Iman has a global cosmetics operation; Kimora runs Baby Phat and has a TV show; Alek has a handbag line and a children's educational program. But what about the next generation of Tyras, Imans, Kimoras and Aleks? Tyra has ended her 16-year modeling career, and some fashion insiders say the industry is backing away from black models. "I think runways have a blackout right now, White seems to be right, the image of what beauty is," says Veronica Jones, owner of Grand View, a Nyack, NY women's apparel store. In the 90s, the industry gravitated to celebrity models while its appetite for African-American women waned in favor of women from Africa and Eastern Europe, Jones says. To be sure, the fashion industry has never really been the province of American girl-next-door types of any race, favoring instead women with exotic looks not commonly found in the heartland or the hood. The writer, Keith Reed, goes on to point out that this year, Beyoncé became the first non-model to grace the cover of Sports Illustrated's swimsuit issue, a decade after Tyra made history by becoming the first African-American model to land on the cover. Other black women land covers, but they are usually entertainers: Halle Berry, Janet Jackson and Jennifer Hudson. Where are the black models? Audrey Smaltz, a former model who now runs a company which handles backstage preparations for Fashion Week, says the industry doesn't embrace black models. "They like exotic-looking blacks, African-born blacks," she says. "They're blacks born in Somalia and Sierra Leone, very few blacks from America. Why?" Good question. We can only think of one current black model: Chanel Iman. But in the past, several worked at once: Naomi, Tyra, Veronica Webb, Karen Alexander — and more recently, Oluchi and Liya. Tyra's show, America's Next Top Model, may showcase American black girls who want to be models, but do they make it in the fashion industry — and on a real runway? Where are the new black models, and why don't we know their names?